Tom shares some photos today from an Amish bulk foods store in the Jasper, New York Amish community (about 90 minutes south of Rochester). 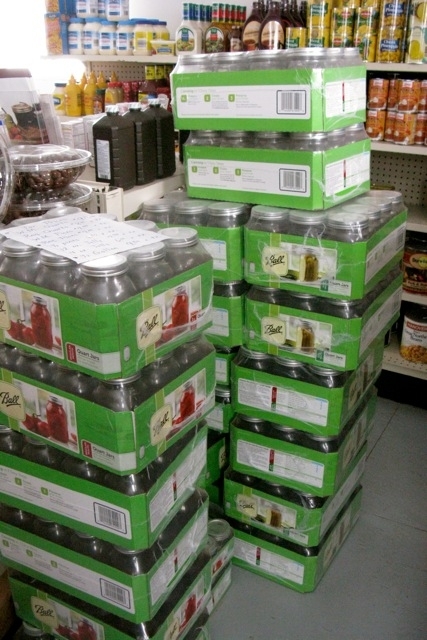 Amish bulk foods stores repackage large lots of food and cooking ingredients into smaller portions. Mason (or Ball) jars are a must-have when canning time comes around. We’ve been discussing Amish heating lately. Here’s a little coal power. 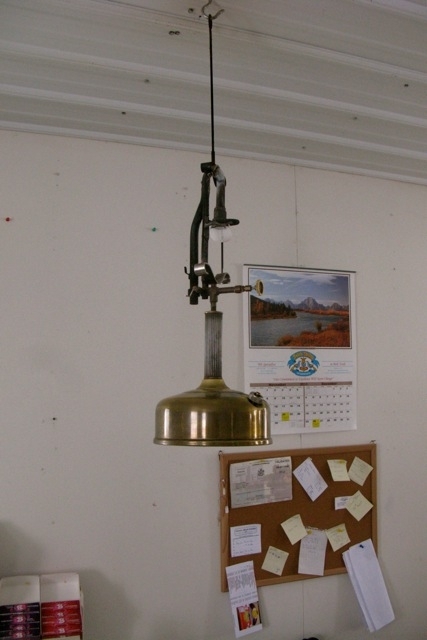 Amish lighting in homes and stores can vary. Checkout time! 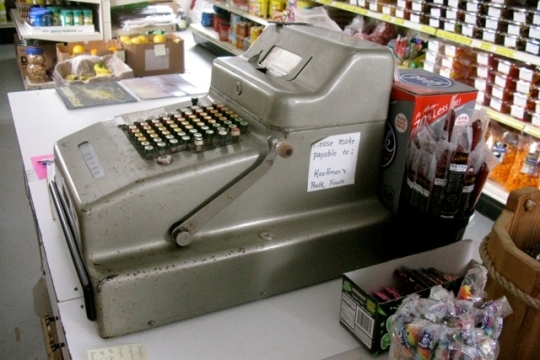 Non-electric registers and adding machines are common in more conservative Amish shops. Do you know a good Amish bulk food store? Let us know in the comments! Would you buy food from an Amish bent-n-dent? I love to shop in Amish stores like this one. One of the items I buy almost every time I go is their base powders for soups and stews. The chicken base and beef base make broths so rich and delicious. The shop in Shipshewana, The Dutch County Market has the most delicious jams and jellies and they’re much less expensive than those at our local grocery and about 10X better! Love the homemade noodles, buying bulk dried fruit..so many things you can’t find anywhere else. My husband and I love to visit Amish communities on day trips and the bulk food stores are always on the list to stop and shop. Helmuth’s Foods is my favorite They are only open on the second Thursday of each month (in the winter months) Their store is located west of 800W on 750 North in Kosciusko County. This is between Nappanee and Etna Green, IN. (This is on a farm.) There is no heat in the building and you usually have to stand outside in line for 10-15 minutes. They have a lot of bulk frozen meats along with cereals, canned food, diapers, etc. This store looks much like the “bent and dent” I frequent when I’m home in Atlantic, PA. They have a fun variety of items- one of my favorites is gum– 3 packs for a dollar. For someone who chews gum nearly all day, it’s quite a bargain. I find it funny that I drive the same year and color Chevy Lumina that’s parked out front (in the first picture). lol If it was in Pennsylvania, it could have been me! I love beaches in Arthur il. 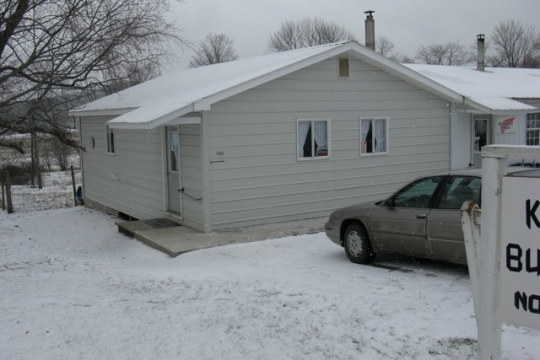 We also make monthly 2hour drives down to Shipshewana Indiana to E&S sales. My freezer is stocked with old fashion oatmeal and spices, along with many other things. We love the chow chow! E&S is even carrying more and more organic products at much more affordable prices than regular stores. I like shopping at the bulk stores. Very reasonable prices. I go to one in Chucky, TN (near Greeneville, TN) not too far from where I live. Lots of the meats and cheeses come from Ohio. It is a “tourist stop” for folks. I believe a Mennonite family owns it. Lots of different things there. Great pictures as always. Kathy there is one in Bulls Gap call the Yoders nice store to i was there yesterday i get my flour from them nice people also i go to both of the stores. I have been to the one in Bull’s Gap a time or two. Also been to one up around Bristol or Abingdon area. Where is the fourth one located? They all are neat stores. Are you in the Tri Cities? I am in Kingsport. I wish there was a store like that near me! So do I … wish there was one near me. Well, actually I wish there was one near you as well! we have 4 of the Bulk stores all about an hour away from me here in Tennessee i go to all of them. Yoder’s is owned by Mennonites and is located on the town square. My wife and I enjoy shopping there when we visit Mountain View. 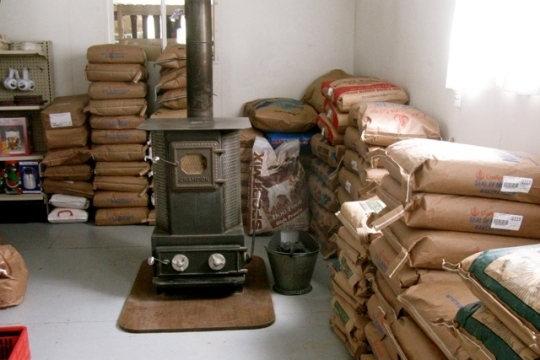 Our friends near Lewistown, Montana, opened a bulk food store in April 2011. They also have a deli, and sell bent-and-dent, Troyer Cheese, and ice cream. Big Sky Grocery is at 64682 U.S. Highway 87, Moore, MT 59464. This store looks a lot like the General Store where we shop in scottsville, KY. It is run by old order Mennonites. LOVE shopping there!!!! Yoder’s Discount Grocery near Hazleton, Iowa in Buchanon County is a favorite. 1456 130th St.
Could you give tell us where this bulk store if located? We love these stores and have visited many that are mentioned in this article. Sometimes, as you know, these stores are down some dirt road and not that easy to find. Also, we are going on our annual trip to Kalona, Iowa in April, we would like to drive through Buchanan County on the way, we hear that it has one of the largest Old Order Amish comnnities. I didn’t quite understand but I think you’re asking about the location of the Iowa store? This post is about a NY community store, I do not have the address but maybe Tom does. I send a note by mail to Sadie and tell her when I will down and she special orders item for me. I live in Mechanicsville, MD in Amish country. There is only one small Amish bulk selling store in my city. The closest is 1 hr and 15 mins away. Do you know where I could purchase all the bulk spices, noodles, flour etc that the Amish purchase for their stores? Some basic directions to Yoder’s would be to come south on Hwy 150 out of Oelwein,Iowa. Turn west onto Hwy 281 (100th St.) as you approach Hazleton. Go to County Rd. W13 (Amish Blvd.) and turn south. Travel to 130th St. and turn west. It is not too far on the south side of the road. There are many nice shops in the area; you should be able to acquire a map of the area in one of these. Hopefully, if you come thru another way this will give you some idea of the location. Good luck! Sometimes we have trouble finding these places. We live in minnesota and travel down through Harmony to get to Kalona, This area would be kind of on our way. We are campers and it looks like there is a campground called Fontana Park. We could stay one night and see the sights in this area and then be on our way to kalona. Have you seen the stores in Clark County, Wisconsin? Not as good as Shipshewana and Beachy’s in Arthur, Ill but good all the same. Buck Creek Kountry Store is over in that neck of the woods also. The address I have on the pen I got from there is 1173 145th St, Fairbank, IA. If you’re coming south on US-63 outta Minnesota, pick up East Dunkerton Road (goes thru Dunkerton) before you get to Waterloo. Go east on Dunkerton Road til it T’s out at Baxter Ave (it’s about 14 miles. but it’ll be gravel once you cross V-62). Go north on Baxter Rd just a hair over a mile. When the gravel road starts to curve east to go over a creek, SLOW DOWN. The farm’s right there on the north side of the road as you cross the creek, and the store’s right to the east of that. My dad was the english that would replace hammer handles, pick handles, etc for that Amish community & I remember them fondly. Just in the last year the Mennonite women opened a store in town (Taylorsville, NC) just like the one you have pictured. I thought I had died and gone to heaven. I was used to going up north every year or so in the past to go to E&S in Shipshewanna. This is just fantastic – the spices are so much better and cheaper than in the stores. If you are a big baker or Christmas baker like me, there are no fresher or better chocolates to melt, or nuts and dried fruits. Ours even has fresh baked goods on Fridays. 1) Do these stores sell rice? 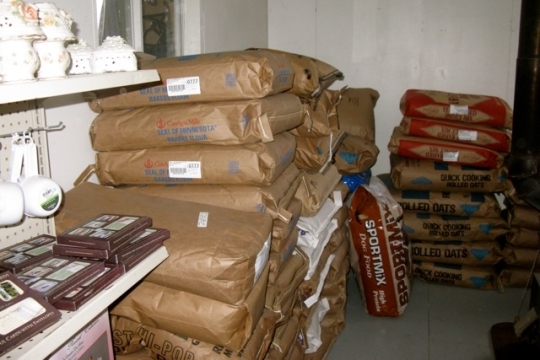 2) Are the bulk products sold (flour, corn, etc) mostly produced by Amish or are they bought from other wholesalers? What about the vegetables? 1) Probably a number do. 2) Generally not produced by Amish, but bought from wholesalers and repackaged. 3) I don’t know, probably not too common. Keeping things simple, food items are usually pre-packaged. a bulk food section, with items in the barrel you can package yourself. These stores are gaining poplularity in Oh Amish areas and so getting crowded with lines, etc-people travel to get to these stores, as many here have posted, and stock up, so Amish Bulk food stores, like many Amish business we see here, are thriving. Is it possible to buy the “base powders for soups and stews (chicken and beef)” by mail? I live in Tucson, Arizona, and there’s nothing like this here that I’ve ever found. One place that mails bulk foods and vitamins is Bulk-N-Natural Foods, 3737 Bahia Vista St., Sarasota, FL 34232, phone 941-957-0595. It is Mennonite owned. They don’t have a catalog. Another option for chicken base is Better Than Bouillon in a glass jar from the grocery store. Some chicken base has MSG, which some people are sensitive to. 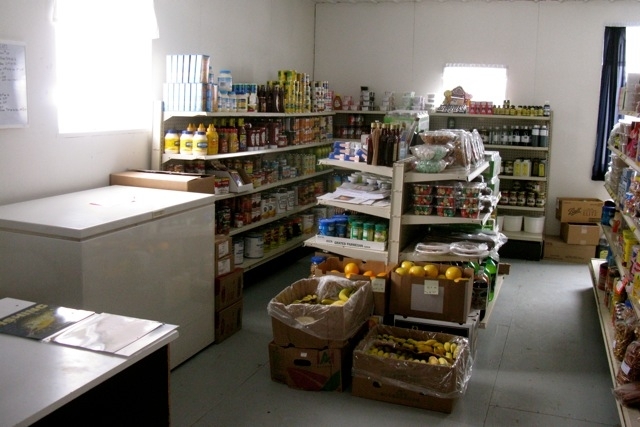 If you want to order online, Sharon’s Country Store has bulk foods and is owned by Mennonites. 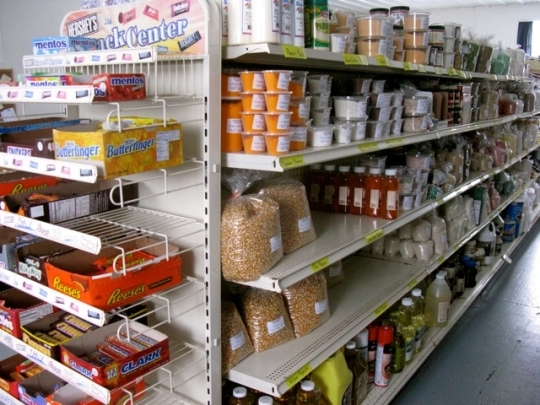 We have a bulk food store and 2 scratch and dent stores in the Carroll Co. amish community. The bulk food store is known as Edna’s and is on Rush Rd. The sign (when it is up) says “Bulk Food”. She also has some notions and some plain fabric. Stillfork was the first scratch and dnet in our area and is Arbor Road. The newest scratch and dent is Sunshine Valley just west of Mechanicstown on Rt. 39. Sunshine also has locally grown meat, honey, plus fresh bread and milk. I shop at all three. All three are owned and run by Old Order Amish. Bulk Foods~Bent & Dent Groceries, etc. 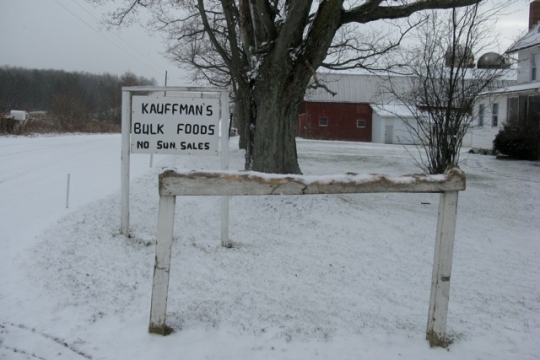 There are so many bulk food stores near me that I haven’t been to all of them, but I love East Union Bulk Foods in Wayne Co. Ohio. On the rare occasion that I make it to Mt. Hope, I like to go in the Mt. Hope Health Food Store too. It is fascinating how grocery shopping can be so different in different parts of the country. In the big cities of the Northeast there is nothing like a salvage grocery, although there are options from the low-end corner stores and bodegas to high-end organic supermarkets as well as regular supermarkets of various quality throughout. Looking on the internet I see several people have compiled lists of bent n dent stores, with a lot of them in Ohio especially. I hope to visit one sometime. We have a sizable community of Amish and Mennonite here in “Big Valley” in central, PA, Mifflin County. There are also a number in our neighboring Juniata County. My neighbor is a very successful Amish businessman, who sells garden tools, fence wires, heating and cooking stoves, oil lamps, and much much more. He travels to Lancaster PA every 2 wk to pick up supplies for himself and other local Amish businesses, including bulk foods. Since I taxi his family on occasion, I’ve learned there are many, many more businesses tucked away than meet the eye. We also have 3 well known stores closer to the main roads, once Amish or conservative Mennonite owned, but they have modernized with electric, phones, credit cards like any other in the last 30-40 yrs. If, like Erik, you become known and accepted among them, you will learn of many other opportunities for foods and other items. 2 wks ago, I was running a lady on errands and stopped at a farm that had just butchered hogs. Turns out they do this every week or two in the winter. I was able to get some EXCELLENT fresh sausage, scrapple, puddin’ meat and pork loin for a lot less than the big chain stores on sale! Last fall, I learned there is a Mennonite family that runs a motor route to Amish farms with 4-6lb blocks of various cheeses and bologna from a well known manufacturer. In fall, they also sell turkey hams, several types turkey sausage, ground turkey by case and box lots WAY LESS than the grocery stores. It was all frozen and managed like a co-op, with some extras for “guests.” Love living here!!!! If there is a way we could purchase some scrapple, puddin, and/or homemade sweet Bologna, my family would be THRILLED! I’ve found commercial scrapple here in central IL, but my dad would kill for some puddin! Beechy’s has commercial scrapple but that’s a far as it goes. If anyone even had a recipe for puddin, my Mom would be willing to try that. I’ll be eternally grateful to anyone who can/will help! If you are looking for Puddin and sweet Bologna and other good meats Try Peters Bros. In Lenhartsville, Pa. They also have Tripe. MMMMMMMMMM so good. Sorry that I'm late commenting on this topic! One we have enjoyed is Glenn’s Bulk Foods in Pleasantview, Kansas, just immediately southwest of Hutchinson. This is somewhat in the vacinity of Yoder, Kansas, an Amish settlement. You can also get your bulk supplies at the Dutch-Way Markets in Schaefferstown, Myerstown, and Gap, as well as the Oregon Dairy Market in Lititz and Yoder’s Market in New Holland. With the canning and the bulk food store threads providing a great deal of information about Amish life on how they sell and keep food, I have a request, maybe we’ve done it and I forget, but how do the Amish cure or at least lessen the impact of the common cold. I have a doozy and it wrecked my weekend. Advice? Help! Unckers it works. It’s kind of like vicks. rub some on the bottom of your feet and put on some socks.I find it at most of the bulk food stores. kathy i am from pigeon forge Muddy pond has a good size store besides food they sell furniture, pictures, notions ect it’s going west towards nashville you can google it. Marcus Yoder: If I get out tomorrow I’ll see if I can find that in my local bulk store. I use Vicks and it helps me sleep a few hours, but when I’m sick I never have the energy to get up and reapply to my chest. But I will look into that. My cold got less today then got worse. I’m trying to get myself better hydrated. We have a few in the area that I know of, I am just 45min SW of Columbus Ohio. I frequent one more than others and love being able to talk to the owners. I just had the wife’s mom make up 5 twin jean quilts and they are really nice..the children loved them for Christmas! I know there is a bigger one and I have yet to get there. I like that we have the Amish(maybe some Mennonite) around us. I am not sure how to tell the difference as I talk to a fellow Catholic and she is in Amish country here in Ohio(around Lehmans) and her husband was raised Old Order I guess. She loves her inlaws and is always helping with weddings and such and she says there are different ones(with diff. degrees of rules–some have cable/internet, etc). Amish people own this country store and sell bulk foods and baked goods. It is near Lawrence County. 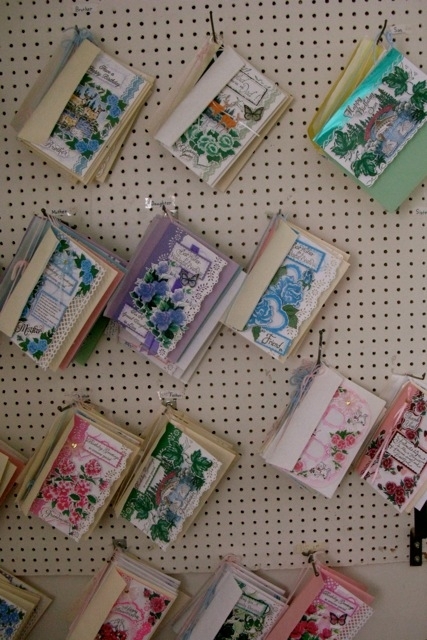 Does someone have a source for Greeting Cards that the Amish or mennonites make? I live in Wisconsin, but anywhere is fine. there are a bunch of stores in partyville wisconsin. Almost all of them on one road. You could check there for greeting cards. Christine, I know a man who hand-paints greeting cards, and sells them for $3 each. Do you want Erik to put us in touch? Sorry Harry, just saw your comment and question as I was going over some older post. If you look back at my list I did put in parenthesis under Centerville Bulk Foods that they are currently closed for remodeling! Anyway, I’m not positive but believe they are due to open around the first week of May, and am really hoping it will still be as nice and inexpensive as before. Of course with the newness and expansion it will lose it’s down-home and old timey feel, but I just hope they don’t jack up the prices along with it! Packaging dates / Nutrition &amp; Ingredients info. I just shopped an Amish (or Menninite)grocery store in Kalona,IA? I am curious about the dates on the bulk packages,is that an expire or package date? There are no nutritional or ingredient information on the products. Also, I prefer to purchase local and or at least from the US;there was just no information nor assistance so I hesitated to buy. Another thing,I will use bulk flavored gelatin and pudding mix for an example;there are no instructions as to ratio and or amounts,recipes or suggestions on how to use these products. I had lost my catalog/recipe booklet from Stringtown and you are practically helpless without the measurements when you buy bulk foods… Thank you again ! The bulk food stores I am familiar with do not include any “Use by” date on their packaging, and I’ve always wondered about this. Is it not required? I am planning a trip down to Centerville Bulk foods this summer. I go every year. Do you know if it is open yet and if not, the expected time of reopening. I am coming down end of July. Friends of mine did shopping @ Centerville Bulk Foods this weekend (7/21/12). They brought me back some treats and said the store looks great. The use of skylights in the remodeling brought a lot more light into the store and the floor around the freezers were no longer “squishy”. I have never been, and I found this site trying to get more info on the store. Enjoying the information that you are sharing. Thanks! I live in Utah bton a trip to Illinois bought some giant oreo cookies without filling, ice cream sandwich cookies, and little marshmellos like are in lucky charms. Everyone who has seen them wants some. What wholesesaler do the stores buy from? Marilyn, the little Lucky Charms marshmallows are sold online at www.sharonscountrystore.com/baking-supplies-3/index-3.html. Sharon’s Country Store is in Bonners Ferry, Idaho, phone (208) 267-7579, and they call this item Dehydrated Marshmallow Bits – Assorted. One wholesaler is www.dutchvalleyfoods.com/products/candy/marshmallows, phone 800-733-4191, in Myerstown, PA. Marshmallows could be considered a baking supply, or a candy. Or maybe part of eating 5 rainbow colors a day! If you ever get to our area of VA, please visit Anderson’s Country Market in Madison Heights. We are located just north of Lynchburg, home of Liberty University. Our website is www.andersonscountrymarket.com. I am not sure I checked the box to be notified of a reply, so if you want me to send you anything, please reply to this one, Marilyn, so I get notified of your reply. Thanks! There is an Amish community just outside of Edgewood IA that has a bulk foods store with an attached Amish furniture store. Another newer bulk foods store is located in the Buck Creek Community near Hopkinton. I’d be happy to give directions to anyone who’d like to visit these stores. My experience is that you have to watch expiration dates. I rarely have a problem but it’s always good to make sure cans and boxes aren’t too dented or opened. I have great luck with “gourmet” foods that I would normally pass by in regular stores because of the price. My son recently discovered one not far from us. The owners moved to the area about 3 years ago, from Pennsylvania, so it is still small. I LOVE to go there!!! Since the discovery in late December I have been there twice. I NEED to go again. Missed putting the address is Sumner, IL. Have been shopping at these places for a few years now. There are a few Amish Bulk Foods stores in Homer, MI that are Amish run. Sells homegoods Red Wing shoes, fudge, chocolate, seasonal, toys, gifts, misc. Small store with bulk goods, some produce, cereal, and bakery pies, doughnuts, and the best hand pies (fry pies) ever! A growing Amish population here, many different stores in a rural area, there’s a flyer in the stores that lists all the different local businesses. Are the two stores you mentioned just a mile or so from each other in Homer? I was going to take a trip out there in the next couple of weeks to check them out. I met an Amish woman this past week at a local farmer’s market that suggested I visit their bulk food store off 29 Mile Road. We now have a new Bent and Dent and Bulk Food Store in Bloomingdale, Michigan. It is run by the Amish. I use to go to Cebterville to Miller’s or Yoder’s, but now it is only 5 miles for me. I do go to Shipsawanna, In, once a year. I buy all my spices, and baking things from there. I dont know that the 2 bulk stores I frequent in Geauga Co Ohio are Amish owned.. I know the one in Mespotamia isnt.. but its definitely frequented by many Amish and they employ them. One opened in Middlefield a couple years ago & the prices are better. Not sure who owns that one but I’ve only seen Amish women running it. There was a Bent & Dent store that was Amish owned in Middlefield too but Im not sure its still there.. its been many years since I’ve stopped. In the Upstate NY Finger Lakes Area I would recommend Sauders which is owned by Mennonites. It is HUGE…almost the size of a modern grocery store. They have recently added on to include a cafe area. They have a large book section, boxed greeting cards, bulk foods, meat case, bakery items, fresh fruits and vegetables, cooking gadgets and more. Prices are very reasonable. People come from miles around to shop here. Located on River Rd., Seneca Falls, NY. Definitely worth the trip. Does anyone have a current list of northern Indiana stores? Several have already been mentioned: E&S Sales in Shipshewana is a good one, especially for bulk supplies. The Dented Can, in SR 119, Goshen, is really close to me and I go there every week or every other week. They have a great deli with fresh meats and cheeses, and it is very clean. You can get a loaf of the more expensive breads, like Brownberry, which are close to or just past the use-by date, for 1.25. That sure beats 3.99 or more in the regular grocery stores! Pinehill Discount in Bremen is another one I go to from time to time (just a few miles from Rentown, mentioned above), as well as Raber’s Discount in Wolcottville. Some in this area come and go within a matter of months or a year or two. Hard to keep track of them all! They aren’t big into publishing in a directory or anything, and rely on word of mouth I suppose.